It's simple to be saved!!! There is much criticism in religious circles today about what they term a “1-2-3 Gospel.” Others call it “Easy Believism.” Like it or not, the Word of God teaches that it's easy to be saved... “For whosoever shall call upon the name of the Lord shall be saved” (Romans 10:13). YOU ARE A GUILTY SINNER! And so am I. Unless you accept Christ's sacrifice on the cross as payment for your sins, you will spend eternity burning in the Lake of Fire. Christ is our sin payment! Anyone who says that it's not easy to be saved is teaching “ANOTHER GOSPEL” (2nd Corinthians 11:3-4). The Good News (Gospel) of Christ's death upon the cross for our sins, His burial, and His bodily resurrection from the dead three days later, is all that you to believe to be saved. If you admit that you are a sinner in God's sight, and you receive the Gospel as full-payment for your sins, you are saved immediately and securely forever. Subtracting or adding anything more is a false plan of salvation. There is much confusion, heresy and controversy in our churches today over the meaning of “repentance” concerning salvation. You cannot show me one Scripture from the Bible that says to “turn from sin” or “repent from sin” to be saved. Romans 3:19 teaches that the PURPOSE of the law of Moses is to be used as a measuring stick, by which when compared all men realize they are guilty sinners, totally incapable of saving themselves. Repentance is a “CHANGE OF MIND” (Greek: metanoia)—a change of mind about what YOU WANT to do to get to Heaven, to what GOD SAYS you must do to get to Heaven. To inherit eternal life, you CEASE from your own self-righteous works and COMPLETELY REST in Christ. Hebrews 4:10, “For he that is entered into his rest, he also hath ceased from his own works, as God did from his.” This Scripture speaks of resting in Jesus Christ, Who is our Sabbath today. On the Sabbath Day, God's people rested, ceasing from their long 6-day work-week (which represented man trying to earn His way to Heaven, by keeping the Mosaic law). To be saved we repent from DEAD WORKS (Hebrews 6:1), and instead COMPLETELY REST IN GOD'S IMPUTED RIGHTEOUSNESS by faith in Christ. Isn't God awesome! The unsaved religious people in Matthew 7:21-23 were trying to establish their own righteousness by their “MANY WONDERFUL WORKS.” They even did their works in Jesus' name. Yet the Lord said to them at The Great White Throne Of Judgment... I NEVER KNEW YOU! Will you one day in eternity hear those same horrifying words? In his excellent book, I NEVER KNEW YOU, Michael Patrick Bowen states . . . SOURCE: I NEVER KNEW YOU (.pdf), by Michael P. Bowen; by Barbour Books, © 2009; page 77. Excepts from the book. Beware of the false teaching in most churches today, that you must count the cost, desire to stop sinning, commit your life to Christ, and surrender fully to Christ's Lordship. I call this a “fork-tongued” gospel, because the presenter of such a confusing gospel is telling you that salvation is a free gift that you must earn, which is impossible! My friend, it is simple, free and EASY to be saved. God only requires childlike faith to be saved. Anyone who comes along making salvation HARD is teaching a false gospel of a works-based salvation. Sadly, there are false prophets amidst our brethren in the churches, who have crept in unawares, bringing in damnable heresies. Christ bore the total weight of our sins on the cross. Beware of any preacher who places the burden of sin upon the sinner. Jesus doesn't forgive sin. That's right! Jesus has already paid for everyone's sins. This is why forgiveness of sins and eternal life are free gifts, which need only be received by faith to obtain. Well, MacArthur certainly makes it “hard to believe.” Clearly, MacArthur is teaching works salvation that only a blinded fool would deny. Repeatedly, in all of MacArthur's books, sermons and Bible commentaries, he teaches that believing on the Lord Jesus Christ is insufficient to save anyone. Acts 16:31 calls him a theological fraud. On the front cover of MacArthur's book, he speaks of the “high cost of following Jesus” (see bottom of book cover). What does that have to do with believing on Christ? Tragically, MacArthur has confused sonship with discipleship. Clearly, this is a false gospel that perverts the free gift of eternal life. Remember, MacArthur said: “The life we live, not the words we speak, determines our eternal destiny” (page 95, HARD TO BELIEVE). That is a big lie of the Devil. If the life we live determines our eternal destiny as MacArthur states, then we're all going straight to hellfire to burn forever and ever!!! If we have to repent of all our sins to get to Heaven, then we're all going to Hell. The very idea that a person cannot be saved unless they determine to stop living in sin is HUMAN EFFORT, a self-righteous work, which perverts grace into works. 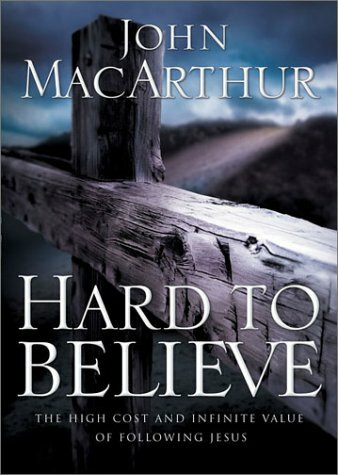 I just find it so ironic that MacArthur would write a book called “Hard to Believe,” when the Bible plainly warns against those who would attempt to deceive us from the “SIMPLICITY THAT IS IN CHRIST” (2nd Corinthians 11:3,4). Please read, John MacArthur Perverts Hebrews 12:14 and The Confusing World of John MacArthur. Ray Comfort does “err, not knowing the scriptures” (Matthew 22:29) concerning Matthew 7:22-23. Mr. Comfort would errantly lead us to believe that the religious group in Matthew 7:22-23 were not saved because of “quick fix” evangelism, but that is not the truth at all. In fact, the “quick fix” of trusting Jesus Christ is exactly what they needed. If you know that you're a guilty sinner and trust (REST) upon the name of Jesus, believing that He is the Christ (Who died, was buried and rose again), then you are saved my friend (Acts 10:43; John 20:31; Galatians 3:26; Romans 10:3-4; Philippians 3:9). The unsaved religious people in Matthew 7:21-23 boasted of their own “MANY WONDERFUL WORKS,” but that's not how to get to Heaven. You must completely REST in Jesus Christ! Literally, Ray Comfort teaches that they didn't try hard enough to reform. Ray Comfort is preaching a false plan of salvation! Repentance is NOT turning from our sins to come to Christ; but rather, turning toward God to be forgiven of our sins by faith in Christ. Repentance is the realization that I am a guilty sinner in God's eyes (Romans 3:19), totally incapable of saving myself (Galatians 3:24-26; Hebrews 6:1); and then faith is resting upon the name of Jesus Who died on the cross for my sins, was buried and raised up from the dead three days later (John 6:40; Ephesians 2:8-9). Repentance and faith happen AT THE SAME TIME. Repentance and faith are inseparable. You cannot have one without the other. Repentance and faith are not two separate steps to salvation; but rather, they are two distinct parts of ONE STEP. Salvation is not a process. The new birth is instant, irreversible and permanent. In simplest terms, repentance is realizing that I am a sinner who cannot save myself, and then faith is completely resting in the gospel. Heresy! That is self-righteousness! Adding even the slightest work of self-righteousness to the gospel corrupts it into a false way, a false plan, and a road to damnation. Oh, that Lordship Salvationists would allow the Holy Spirit to do His work of changing the hearts of men; instead of perverting the gospel in a foolish attempt to force men to cease from sinning to be saved. Leave the gospel alone, don't mess with it! Eternal life is a free gift, paid for by Jesus' precious literal blood (1st Peter 1:18-19; Hebrews 9:12,22-24). Salvation is received, not achieved. Please read, Ray Comfort Perverts Luke 8:13 and The Discomforting Words of Ray Discomfort. Contradictorily, Paul Washer claims that salvation is without works while simultaneously teaching that a person CANNOT be saved without making CHANGES to their lifestyle. Paul Washer is teaching works salvation, defining repentance as a changed life (and he requires continued good works as an ongoing process in order to get to Heaven). Blasphemy! The common denominator in the corrupt beliefs of John MacArthur, Paul Washer and others is CALVINISM, which teaches the heresy of the perseverance of the saints. I believe in the PRESERVATION OF THE SAINTS (eternal security). Amen! Biblically, you DON'T have to persevere to be saved. The new birth is immediate, irreversible and not a process. You CANNOT be unborn spiritually, anymore than a baby can be unborn physically. If saved, always saved! It is clear from Washer's preceding statement that he is a Calvinist who believes in the Perseverance of the Saints, which is nothing less than pure works salvation. If we have to work to keep our salvation, then pray tell me how is it a gift from God? A gift is without works, just as Romans 4:5 and Ephesians 2:8-9 teach. Being born-again is not a process. Once a person is born-again into God's family, there is NO sin which they can commit to make them self unsaved again. Once saved, always saved! There is NOTHING which a Christian must do to maintain or ensure their salvation. To teach anything else is a false gospel of self-righteousness! Paul Washer is bad news! He promotes apostate minister, Billy Graham. Graham has a star with his name cemented on the sidewalk at 6901 Hollywood Boulevard alongside Hugh Hefner, Alice Cooper, Marilyn Monroe, Liberace, Michael Jackson, The Beatles and Little Richard. 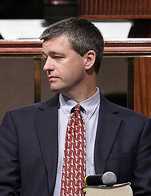 If anyone needs to repent, it's Paul Washer. Billy Graham is of the Devil. How could Paul Washer speak so highly of such a wicked minister as Billy Graham? Sadly, thousands of pastors worldwide adore, respect and follow Billy Graham's apostasy. A growing church is NOT a sure sign of God's blessing, for a dead corpse swells in size. Many churches are only swelling in size because they are dead, attracting the heathen world as the church becomes more worldly. Paul washer teaches a false gospel, which requires a person to continue on God's path of righteousness in order to be saved. This is works salvation. Being born-again isn't a process! Like other false prophets, Mr. Washer deceitfully claims to believe in salvation by faith alone; while simultaneously telling young people that they must have a hatred for sin and stop committing it in order to be saved. Although God certainly expects each believer who loves the Lord to depart from sinful living AFTER they are saved (Romans 3:31); this is NOT a prerequisite to the gift of eternal life (Acts 13:39). Please read, Paul Washer's Washed-up Gospel. The word “imputation” isn't mentioned much anymore in religious circles, and to no surprise because the Godless H.I.V. bible (aka, the New International Version) has completely removed the word. This is one of the main reasons why the heresy of Lordship Salvation has flourished in our churches today, because of corrupt bibles which obscure that Biblical doctrine of the imputed righteousness of Jesus Christ. We read in Romans 4:22 of the trustworthy King James Bible concerning Abraham's faith... “And therefore it was imputed to him for righteousness.” Please read Dr. Jack Hyles' awesome writing titled, IMPUTATION AT SALVATION. Abraham's faith was counted for righteousness (Romans 4:5), i.e., in response to Abraham's faith, Christ's righteousness was placed upon Abraham's eternal record in Heaven. This is what 2nd Corinthians 5:21 declares... “For he hath made him to be sin for us, who knew no sin; that we might be made the righteousness of God in him.” You see, it is Christ's righteousness by which we are saved; and not our own. Proponents of Lordship Salvation fail to understand this vital Biblical doctrine. There is much criticism today amidst neo-evangelical Christians (most of whom do absolutely nothing to win souls to Christ) against those believers who use step-by-step outlines to get people saved. Lazy pastors who prefer “gathering around the Word” instead of going soul-winning attack fervent soul-winners. I'm tired of Bible colleges that do nothing but sell Bible courses. Students go there to be taught the Bible, but they never lift a finger to do anything for God. That is messed up! They never use the Bible as a Sword to fight against the Devil. They never go forth preaching the gospel to the lost. They never start a church bus route. They never build a Sunday School class. Phooey on the deeper-life, dead, religious, formalism that let's the world go to Hell. God give us some PREACHING PREACHERS! For example: The Romans Road is a popular presentation which uses various Scriptures found in the Book of Romans to witness to a person (i.e., Romans 30:10,23; 5:12; 6:23; 5:8; 10:13). Certainly, there is nothing wrong with The Romans Road. Thank God for Church Numbers, Because Numbers are People! Some deeper-life critics speak evil against those men of God who see thousands of people saved each year. The popular critique is that such ministries don't spend quality time with each convert, which no doubt leads to some false conversions. My friend, I have one serious question for you... IS THERE A HELL??? Yes, there is a Hell! Then we ought to be soul-winners! Every Christian ought to be after souls! Every born-again Christian should be laboring to get people saved. No believer is right with God who doesn't have a burning passion to preach the gospel, pray for the lost, witness to the lost, invite folks to church and do all that they can to get people saved. One day our hands will be dripping with the blood of those who died without Christ, and we never witnessed to them. Opposition always comes when a church is getting the job done for God. Satan doesn't mind a small church of 40 people gathering for a Bible study, but you let a church start winning souls and watch the Devil attack them. If your church doesn't give an invitation, you're not right with God. Everyone should be a part of a soul-winning, Bible-preaching, sin-hating, people-loving, Christ-honoring church! Satan doesn't mind a Christian school, but he hates a church that runs busses, knocks on doors and reaches out to the community with the gospel. Please listen to the wonderful MP3 sermon by Pastor Jack Hyles, The Plowman Shall Overtake The Reaper. If you listened to the sermon I just shared with you, then you heard Brother Hyles explaining the blessings of having a church ministry that aggressively goes after the lost, sowing and reaping, winning multitudes to Christ. Dr. Hyles speaks of winning souls with a fishing net instead of a single fishing line. When you use a net instead of a single fishing line, you're also going to get eels, crabs, mussels, tin cans, tires and nearly anything imaginable; but if you only fish with a fishing line, you'll get crappies, perch or bass, et cetera. The point is that when a church reaches folks for Christ with a net, they're going to have a bunch more problems. The more that you do for the Lord, the more enemies, oppression and persecution that you're going to encounter. I'll take the bus kids and a torn up church building. Amen and amen! Brother Hyles mentions seven lawsuits against the church at the time, and many things that went wrong, and disruptive things that bus kids did during the church service; yet he thanks and praises God for the blessings of a growing church that is always sowing and reaping the lost for Christ. Amen and amen! No one is going to sue a small church that does nothing for God. Thank God for a sin-fighting church! Thank God for a confrontational soul-winning church! Thank God for a Bible-preaching church! God wants His people to be after sinners all the time. God may not be interested in numbers, but He dead sure ain't interested in empty pews! In the Bible, Jesus said that He wanted His house FULL. Luke 14:23, “And the lord said unto the servant, Go out into the highways and hedges, and compel them to come in, that my house may be filled.” The sorry, low-down, shameful and heathen attitude that many professed Christians have, which says we should never offend people because it might drive them further away from Christ, is of the Devil. If the Word of God offends people, so be it. If the truth preached behind the pulpit offends the congregation, so be it. If warning people that the Bible says Hell is a literal place that burns with real fire, offends them, then praise God... SO BE IT!!! I care about you and don't want you to go to Hell! If you only have religion, then you WON'T be allowed into Heaven when you die. The criticism is that some ministries use a 1-2-3 method to boost their number of converts, not genuinely taking the time to win souls to Christ. This wrongful critique is based upon the presumption that salvation is hard, that is, that a person must stop sinning and make Jesus absolute Lord of one's life to be saved. The truth is that salvation is simple, as easy as going through a door (John 10:9). Salvation is as easy as drinking a cup of water (John 4:14). Salvation is as easy as eating a piece of bread (John 6:51). Please read the wonderful chapter titled, THE SIMPLICITY OF SALVATION from Dr. Jack Hyles' book, SALVATION IS MORE THAN BEING SAVED. This is indeed a problem in some ministries today. But the problem is not the simplicity of salvation, it's a lack of genuine concern on the part of some religious workers (who likely aren't saved themselves) when dealing with the lost. Prospective converts need to be told that salvation is NOT a religious event, or prayer, or turning over a new leaf, or making a commitment, et cetera. It is a mistake and unfair to say that all soulwinners who use The Romans Road (or some other step-by-step method) to lead the lost to Christ are preaching a false gospel. That is simply not true. Truly, there are NO STEPS to salvation, but to present the plan of salvation in an understandable point-by-point, logical method is fully acceptable. How else can the gospel be presented? How easy is it to get saved? As easy as walking through a door... "I am the door: by me if any man enter in, he shall be saved, and shall go in and out, and find pasture" (John 10:9). How easy is it to get saved? As easy as drinking a cup of water... “If thou knewest the gift of God, and who it is that saith to thee, Give me to drink; thou wouldest have asked of him, and he would have given thee living water” (John 4:10). Oh listen my friend, salvation is a free gift from God, paid for by Jesus' literal, physical, precious blood which He shed for our sins (1st Peter 1:18,19; Hebrews 9:12). Please don't listen to some false prophet who tells you that you cannot be saved simply by trusting upon the Lord Jesus Christ to forgive your sins. MacArthur is a false prophet! Ray Comfort is a false prophet! Paul Washer is a false prophet! Jack Chick, Don Piper, and Kirk Cameron are false prophets! All these men teach that believing on the Lord Jesus Christ for the forgiveness of sins is not enough to be saved. Jack Chick requires lost sinners to “be willing to turn from sin” to be saved. This is a false gospel. Jesus never asked us to be willing to give up anything to be saved—It is the gift of God. Salvation is receiving; Not giving. You don't make Jesus Lord; He is Lord! Salvation is easy. It is so easy to be saved that any child can be saved simply by coming to Jesus Christ as a sinner to be forgiven. Acts 10:43 states: “To him give all the prophets witness, that through his name whosoever believeth in him shall receive remission of sins.” John 3:16 promises: “For God so loved the world, that he gave his only begotten Son, that whosoever believeth in him should not perish, but have everlasting life.” What is so difficult about that? Why do men like Ray Comfort and Paul Washer complicate the Gospel into a lie, saying that a changed life is required for genuine salvation? Although I believe these men are sincere, they are dead wrong... “There is a way which seemeth right unto a man, but the end thereof are the ways of death” (Proverb 14:12). Do believers have a license to sin? ... Yes, technically! Certainly, no one has God's permission or blessing to sin (2nd Corinthians 5:10); but if a believer wants to go kill somebody, it won't affect their salvation one bit. To teach otherwise is self-righteousness. Romans 4:5-6 proclaims that salvation is without works. A man's faith is counted for righteousness. I'm not saying it's ok for believers to live in sin, not at all (Romans 3:31). God chastises (disciplines) and scourges (whips) His children when they sin (Hebrews 12:6-8). I'm simply saying that eternal life is a free gift from God (Romans 5:15; 6:23) which has absolutely NOTHING to do with the life we live (Ephesians 2:8,9). Like it or not, God promises eternal life to anyone who simply receives Christ's death, burial and resurrection (the gospel) as payment for their sins, regardless of their lifestyle. It's easy to be saved. Repentance concerning salvation is a change of mind—a change of mind about what you want to do to get to Heaven, to what God says you have to do to get to Heaven. There is much debate over the meaning of repentance, but if you study the purpose of the Mosaic law in the Scriptures, it is simply to show us that we are hopeless sinners incapable of saving ourselves (Romans 3:19). Thus, the law “BRINGS US” (Galatians 3:24-26) to Christ to be saved by God's righteousness through faith, because we have no righteousness of our own to offer God (Isaiah 64:6; Romans 10:3-4; Philippians 3:9). There is absolutely nothing in the Bible that requires a person to turn away from sinning or surrender their life to Christ in order to be saved. Christ died on the cross for our sins, was buried, and raised up from the dead three days later (1st Corinthians 15:1-4). If that's your hope for Heaven, you are saved. Christ died, that's history; Christ died for me, that's salvation. Do you believe that Jesus is the Christ, the Son of the living God? Come as a helpless guilty sinner and place your trust in the gospel, completely RESTING in the Lord Jesus Christ and you will be saved immediately, irreversibly and eternally. It is easy to be saved! Don't ever allow anyone to deceive you, trying to convince you that salvation is difficult and hard. The only hard part is not tampering with the simplicity of salvation by faith alone in Christ. Acts 13:39, “And by him all that believe are justified from all things, from which ye could not be justified by the law of Moses.” Acts 13:39 means that we don't have to make an effort to stop sinning to be saved, nor does God require any person to stop sinning as a requirement to be saved. To say otherwise is to require human effort to be saved, which is adding works to grace, and then grace is no more grace (Romans 11:6). It is a wicked sin, heresy, and a false plan of salvation to teach people to make a full surrender to Christ, count the cost, forsake the world, stop sinning, intent to reform, start a relationship with Jesus, or commit to serving Christ as Lord AS A REQUIREMENT to be saved.